← Doing my HAPPY DANCE! For a surprise V-Day gift for C I bought an overpriced quart of Strawberries, a small thingie of mascarpone and scrounged up a hunk of Dark Chocolate from the back of the pantry. I washed the strawberries, used a small sharp knife to scoop out the hull (interior) of the berry, then laid them cut side down on some paper towel to drain. I scooped 2 Tablespoons mascarpone into a snack sized ziploc, snipped off the corner and used it as a piping bag to fill the berries’ tummies. I threw the hunk of choc into a large mixing bowl set over a small pan of boiling water. Once it melted I turned the flame to low and stirred the chocolate well. Since it was just a little hunk o’ choc I didn’t have enough to dip the berries in. Instead I scooped it over the cut/filled end with a spoon. I set them on some foil to dry and then surprised C with them. NOTE: If you would prefer a sweeter filling you can add some powdered sugar to your mascarpone. I’d use 1/4 teaspoon for 2 Tablespoons – just make sure you TASTE. Remember – you can always add more. 2 Tablespoons Mascarpone **If you like it sweeter, add powdered sugar 1/4 teaspoon at a time until it suits your taste. **If you don’t have, use cream cheese. TOTALLY works. 1/2 cup Chocolate **I melted in a make-shift double boiler. Feel free to use your microwave! 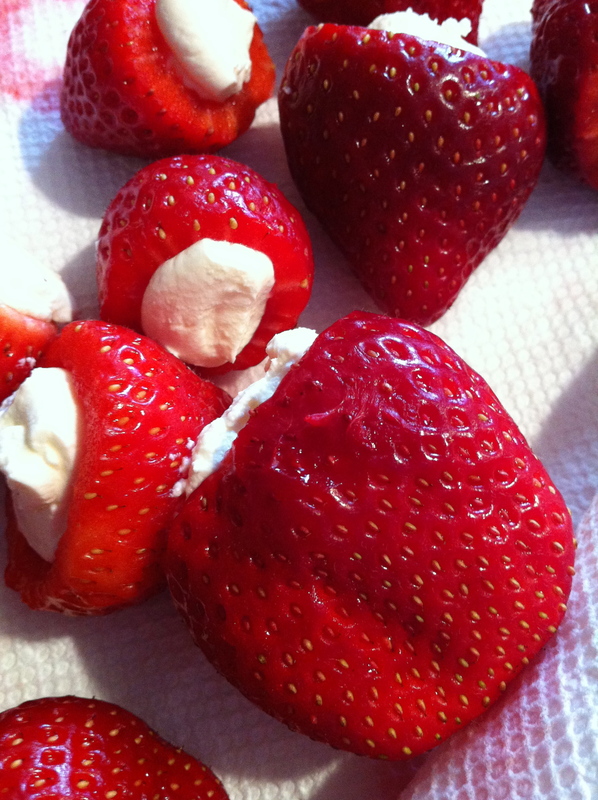 1- Wash strawberries and hull them. Leave them to dry/drain on some paper towels for a minute or two. 2- Start the chocolate melting on the stovetop (dump choc in a large mixing bowl set over a small pan of boiling water – don’t let the bottom of the bowl touch the water. It makes bad things happen.). 3- Scoop your mascarpone into a ziploc baggie. 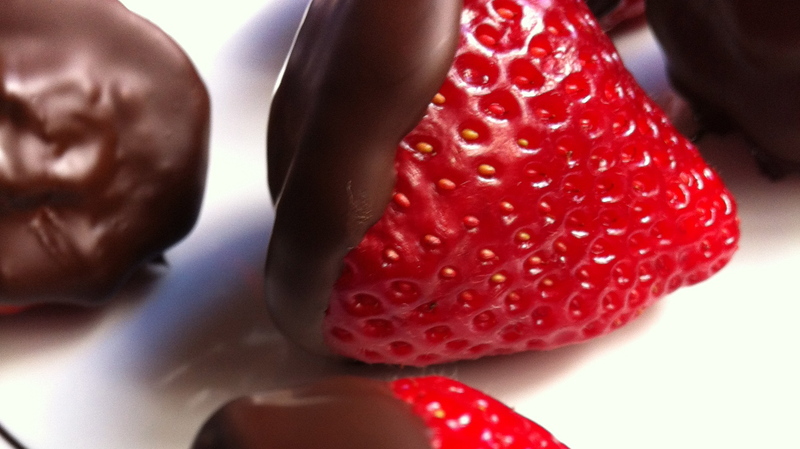 Snip off a small corner and use it as a piping bag to fill your strawberries’ middles. Set aside until your choc is all melty and good. 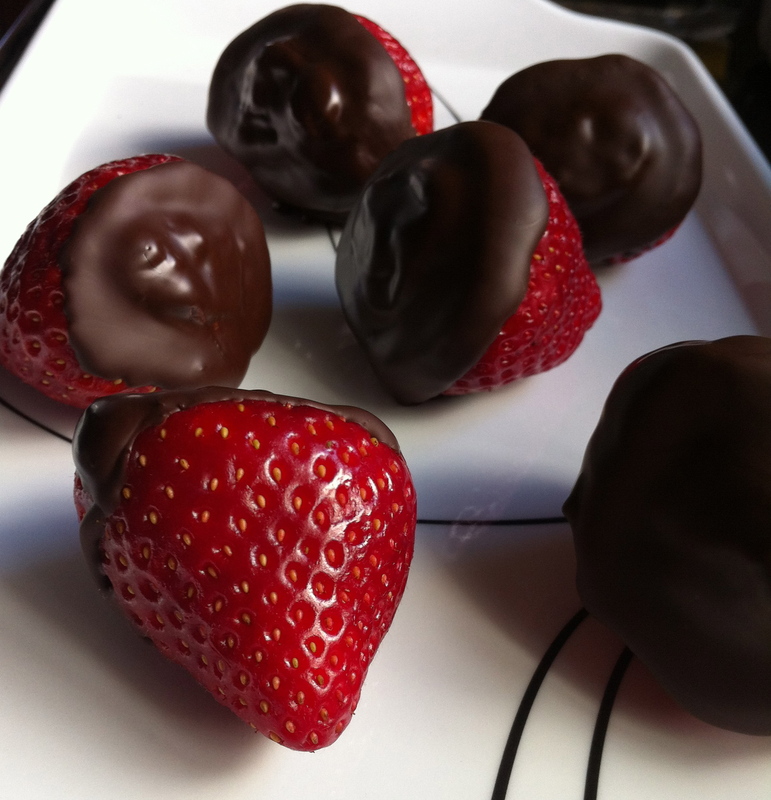 4- Either dip your berries into the choc or use a spoon to scoop and cover the cut sides of the berries. If you have enough choc you can totally cover the whole berry. THAT would be awesomely delicious. 5- Leave the chocolate for an hour, allowing it to harden. 6- Set on a pretty tray and leave in an obvious location. ENJOY!